Croeso! Mae croeso cynnes Cymreig yn eich aros ar benrhyn Llyn - lle gellwch ddarganfod harddwch a heddwch unigryw - a chlywed iaith hynaf Ewrop yn cael ei siarad. Abersoch is situated on the Llyn Peninsula in North Wales and has become a very popular village seaside resort. Great beaches, internationally recognised sailing waters, pleasant climate and beautiful scenery, all set in the heartland of the Welsh language provide a special combination. Why visit Abersoch? Abersoch is the sort of place that people return to year after year. It has a certain special something that is very difficult to describe in words. We hope this website will provide you with an insight into what makes Abersoch special and be of interest to both those who have never been here and those who are regular visitors. 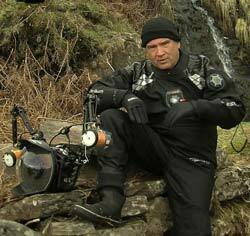 New Website For Graham Eaton... Abersoch regular, Graham Eaton, who is a diver and award winning landscape and wildlife photographer, has a new website to showcase his work. 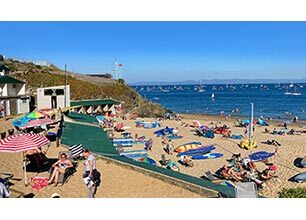 The weather forecast page is regularly updated on 360+ days of the year and provides a overview of the Abersoch weather for the next few days, based on a variety of charts and information. Local tide info can be found on the right hand side of this home page. 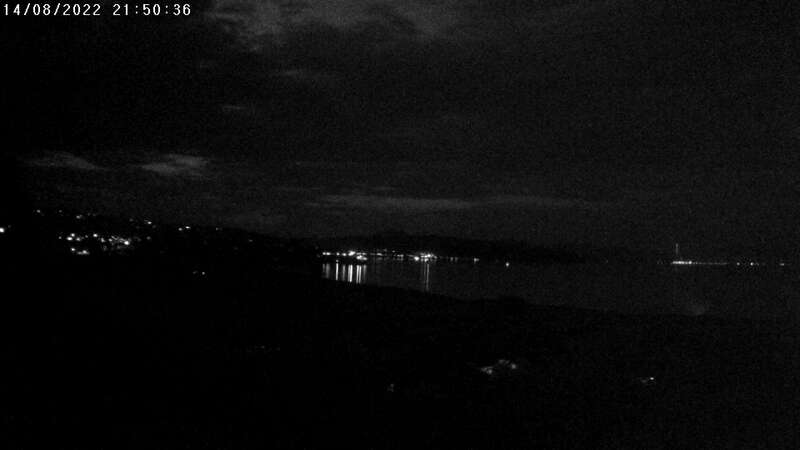 Abersoch has several webcams that can be accesses via our webcam page. We also have regularly updated photos from the area in our popular "recent photos" section by John Wormald of Totally Abersoch. All these can be accessed by using the webcam tab on the menu at the top of each page. Our Guides sections (see menu above) give you an opportunity to browse information on many of our local places of interest, beaches, watersports and other activities in the area. There is also a photo tour from our excellent local photographer - Martin Turtle of Turtle Photography. There is also a large selection of old postcards. Abersoch hosts a variety of intersting events each year including ... the RNLI New Years' Day Dip, Glass Butter Beach, The Abersoch Regatta Events including the Raft Race, the Abersoch Triple Crown including 10K Race, Sprint Triathlon and Half Marathon, local national and international sailing events via SCYC and the annual North Wales Open Surfing Contest. For news of these and other Abersoch events click here. Abersoch is a fantastic location for a number of activities and especially watersports. As an internationally famous sailing area, the waters also provide opportunities for powered boating, fishing, surfing, windsurfing, canoeing and the recently very popular sport of paddle boarding. Links to these and other activities can be found via the "actvities" menu tab. Use the local listings menu tab at the top of the page to access information on local services and tradesmen including builders, electricians, gardeners, cleaners, painters and plumbers alongside adverts for local shops and restaurants, properties for sale, boats for sale and also the latest local job vacancies. More and more people are visiting Abersoch "out of season" as Abersoch is not just about summertime! More businesses in the village are remaining open longer throughout the year - including the cafes and restaurants and more of the shops. You will find that the shops often have winter sales on with bargains you would not normally find during the "season". So if you fancy getting away from all the hustle and bustle of life - maybe a weekend or day trip to Abersoch "out of season," might be the answer. If you are lucky with the weather there are plenty of sheltered sun traps - and it is not unusual to see sunbathers on Abersoch Main Beach in mid-winter! Welcome to Abersoch.co.uk. Online since February 2000 ! Welcome to the third and latest version of Abersoch.co.uk. Its been over 18 years since the site was launched and since then, it has become a regular port of call for friends of Abersoch around the world. Please report any viewing issues via our contact us page and if you would like to advertise on the site, send us an email for the latest prices. Please note that Internet Explorer 6 and earlier versions will not view the site as it should do. Many thanks for looking at the site and please support our advertisers. Blue skies and genuine summer weather for Easter! The lack of breeze has helped the temperatures soar, with Good Friday seeing a busy Abersoch main beach... long may it last!!! The photo was taken on 19/04/2019 and it was uploaded on this page on 20/04/2019. A view of Porth Neigwl / Hell's Mouth (when visibility is good!). Click on the image to visit the webcam page and surf report and forecast provided by West Coast Surf Shop. A multiple view webcam from SCYC looking towards Abersoch Bay & Beach - click here to view the image.  The camera uploads a static image every couple of minutes and the view changes periodically and includes the beach, bay, islands and the SCYC jetty and moorings. The camera is operated in conjuction with West Coast Surf shop and SCYC. A view from Bwlchtocyn, looking across the bay to Llanbedrog Headland. A view of the Warren Beach in Abersoch courtesy of Haulfryn. Click here for larger image. One or two videos from the archives of abersoch.co.uk will appear on this You Tube Channel (click here) - for example we have found a couple that we made for the early Wakestock competitions. Headline Summary: Damp Weather This Morning. Today (Friday): Wet weather at times this morning with drier weather returning later in the morning with a dry and potentially bright spell for a time this afternoon, before the risk of showers increases again late in the afternoon, with another wet spell likely this evening. Winds today are likely to be noticeable, with a strong to gale force southerly, veering to the southwest during the morning and afternoon, before backing to the south or south-southwest this evening and increasing. Tonight: Gales or severe gales from the south-southwest, veering to the west-northwest by dawn. Rain at times, perhaps heavy. Saturday: Early rain, perhaps heavy with a severe gale from the west-northwest during the morning with gusts in excess of 60mph possible. The wind may ease down during the afternoon, but continue to gust to gale force. Drier and perhaps brighter weather for the afternoon and evening. Dry overnight and less windy. Feeling cold due to the wind. Sunday: Still some uncertainties regarding timings of the arrival of a front for Sunday with one scenario having dry weather until some stage of the afternoon, when some drizzle or rain may arrive. Winds look like being lighter, so it should feel a milder day. Outlook: Plenty of cloud at times on Monday, with some sunny intervals developing and it may be a dry day and with winds having a southeasterly element, it may become milder as the wind drops out for a time. High level of uncertainty for Tuesday, as fronts may not be too far away, but it is impossible to know their position in relation to Abersoch at this stage. Potentially fine on Wednesday. Extended Outlook: The outlook this morning for the period from the 2nd May 2019 to 6th May 2019 - is still very much in the balance this morning, with the GFS models suggesting changeable weather giving way to something much more settled, whereas the ECMWF model looks like bringing colder and changeable weather. The Met Office extended outlook suggests dry weaather, so there is still some reason to be optimistic this morning, despite those chilly looking ECMWF charts. .... click here for the more detailed weather page.